Here are mine for my first post. They all work fine but the 7A38 7289 where the 4 o'clock pusher is inactive. I changed the battery, it's clean inside. No clue. My 2nd 7A38, just added to my collection yesterday. October 1983 and in nice (but not perfect) condition. Its been refinished a bit roughly in places by a DIY'er at some stage, so I spent a little time last night, being gentle with a Garryflex bar to bring things back to a more consistent look. 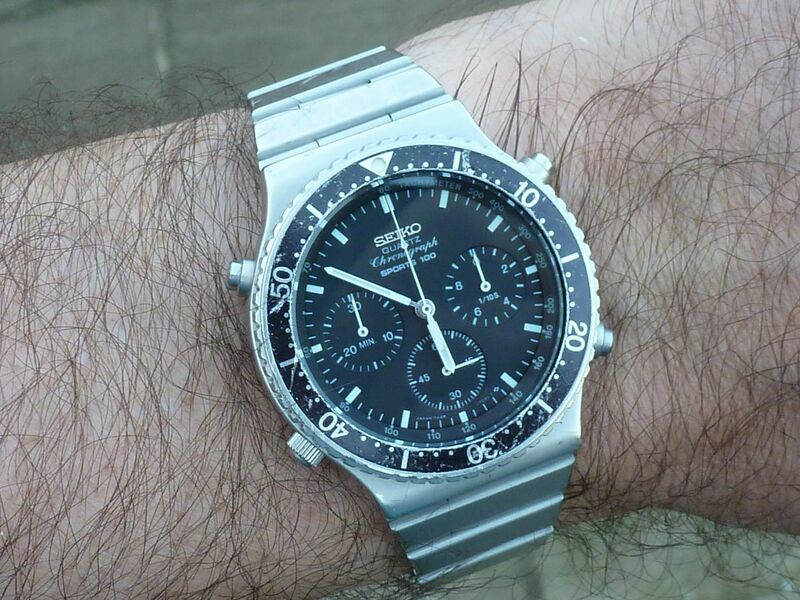 All in all though, a nice example and as with my other 38, a delight to own and wear. Happy to have your comments re originality. If its a Franken, I'd still be happy as it was a good price. 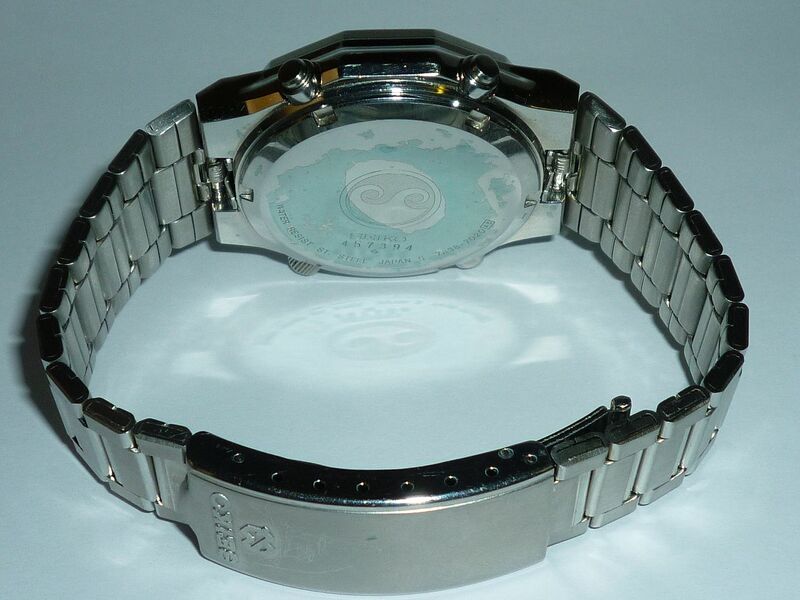 It has a 7 hole clasp with the SQ logo which makes it easy to get a good fit. Finally, a group shot of my two 7A38's with my 7T32 that I bought myself back in 1989. Now... what's next? 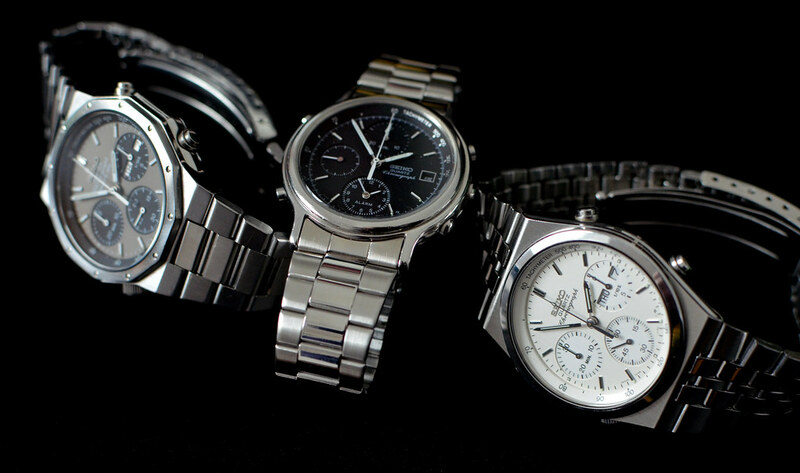 I'm going to have to up my budget next time... maybe a nice 7A28 or a JDM Speedmaster... we'll see! Dear god, I thought this day would never come! 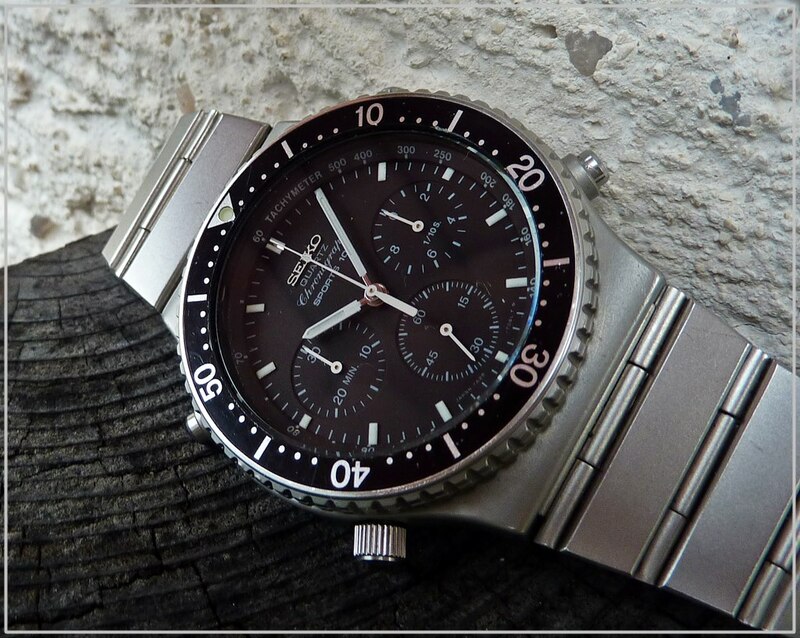 For a watch that's alleged to have been produced in rather large numbers, it was shocking how few of these came up for sale this year. Just one or two in Europe (France and Spain), maybe three in Japan (in varying states of disrepair), and to my knowledge exactly zero working examples in North America. 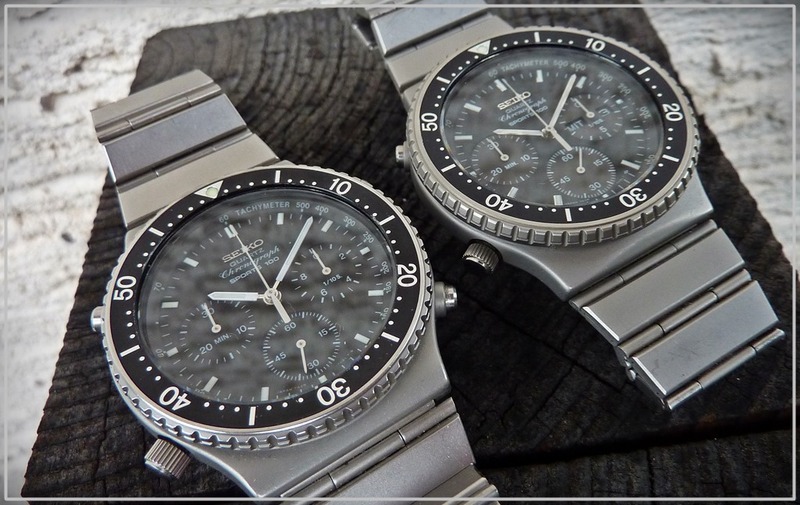 I clearly missed out on those glorious days when these things were routinely exchanging hands for "used quartz watch" prices. Perhaps a few elements conspired to keep this one in a reasonably-affordable price range: it's a bit dirty, sports a few bruises, the buttons are cracked, and the seller failed to include the model number or the name 'Giugiaro' in the listing title so it may have eluded a few potential suitors. 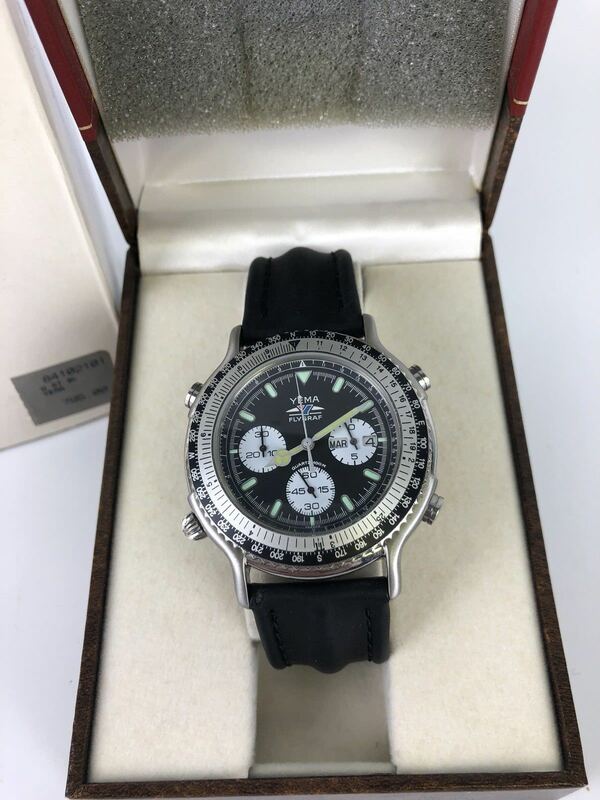 Whatever the case, the bidding pool was unexpectedly small--a watch like this would normally draw a larger number of low-stakes speculative bidders, at the very least. Anyway, yay for me! 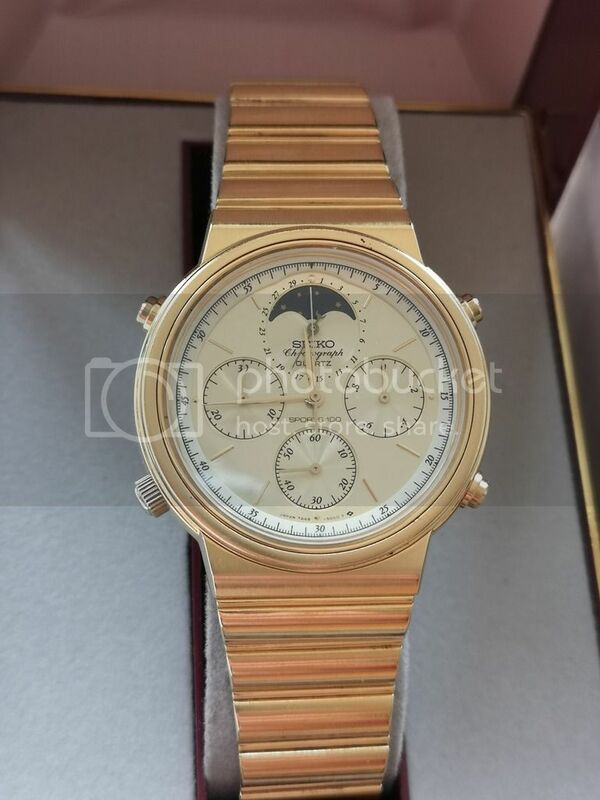 I'll be sure to post pics when it arrives--perhaps a cursory photo shoot with my other recently-acquired Seiko grail: a rather stunning 6105-8119. 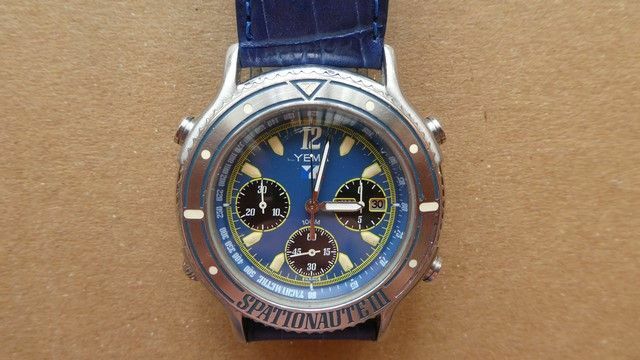 For now, though, I need to wean myself off of looking at watches for a little while--lest I find myself sleeping on the couch until Christmas. 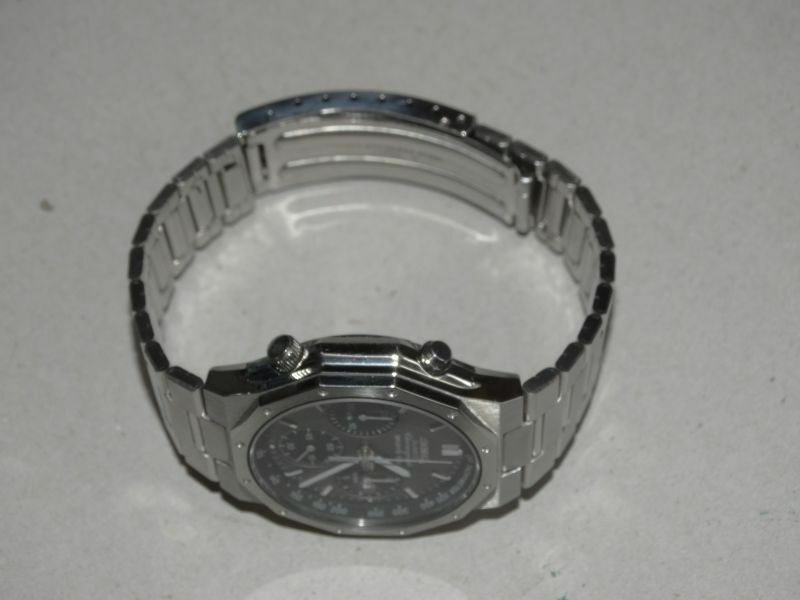 Yes, I know that hour, minute and second hands are not original and also the crown, but I was not able to find such. 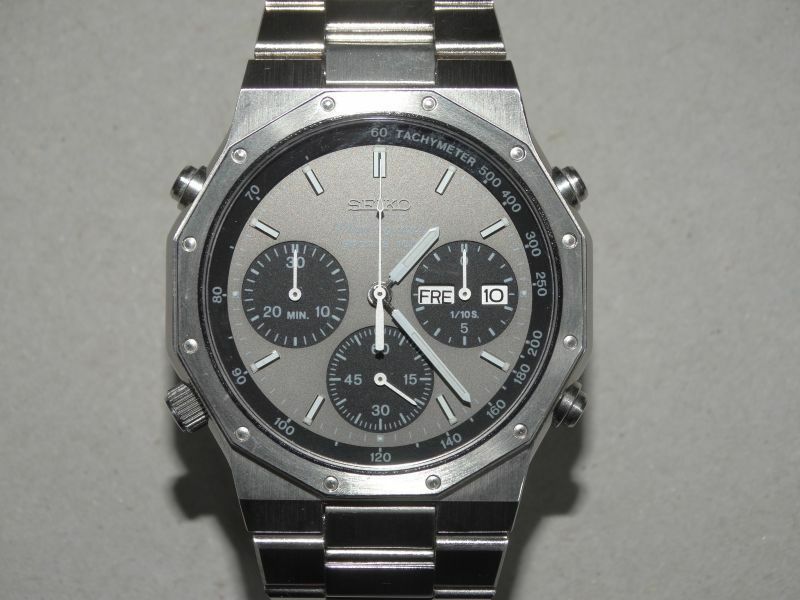 Just got this in the mail yesterday, my next chrono to restore. 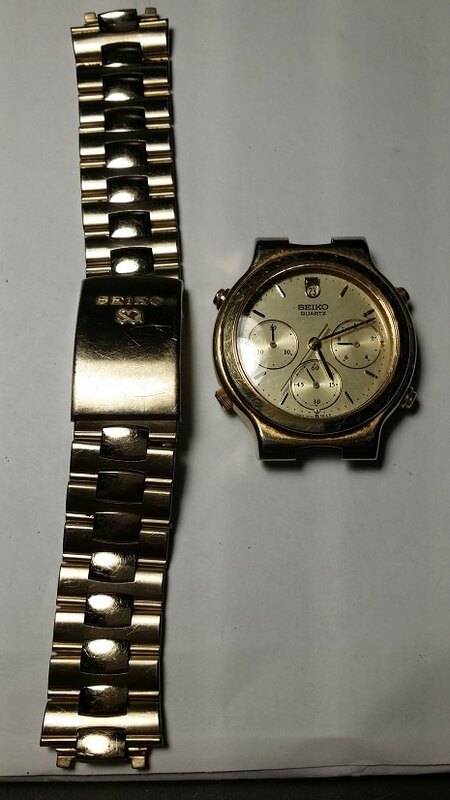 I can't believe it runs great and appears to have the original bracelet considering I paid almost nothing for it. 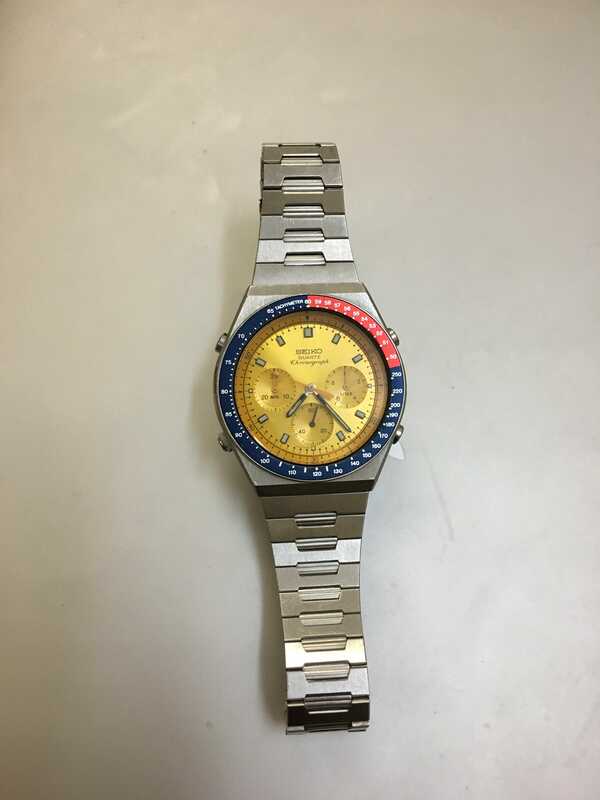 Anyone have a source of info and specs for this 7a34? Specifically looking for the specs on the crystal for a replacement. It appears to have a very low dome, it doesn't look flat. 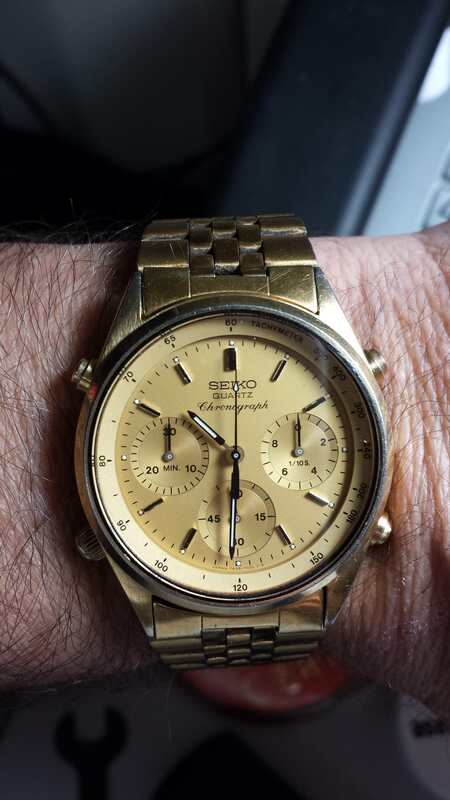 This one I've had since the jeweler unboxed it in 1983. Bought it on the spot, I wasn't even looking for a watch. A few weeks ago I decided to clean it up and replace the crystal. Been through 3-4 bands, working construction, snorkeling in Grand Caymen, skiing in North East US and never let me down. 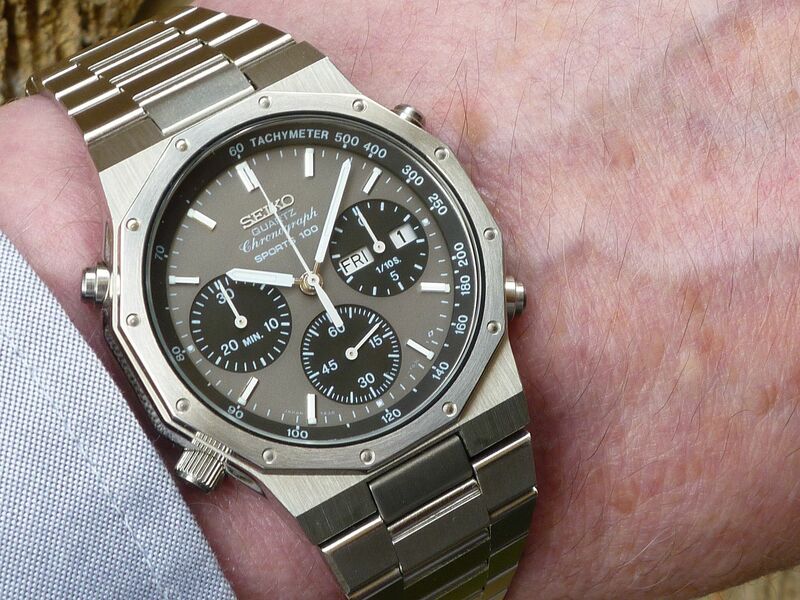 Toughest watch I've ever seen. My newest incoming are a 7A28-7040 and a 7A38-7070, both in very good quality. I got them from a german collector on UhrForum.de. They are not NOS but the surface of the case is still matt and and there is no stretch on the bracelets. 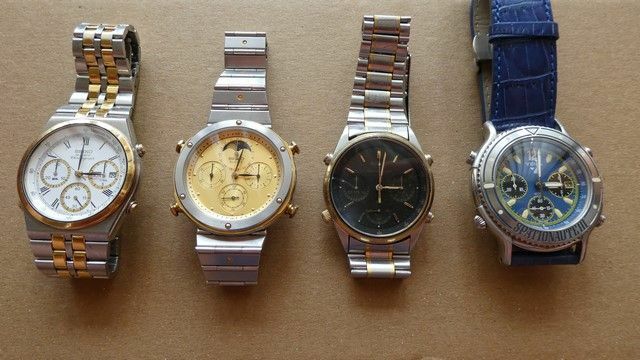 So this are watches which can be used on a daily basis and not just examples for the box. These two models are my favourite 7Axx and I´m glad to have them now in nice quality. Nabbed this not-too-bad condition 7A28-701A piece from Yahoo Japan. As you might be able to tell from the picture though, I believe it's missing the main end-link from the 6 o'clock end as it doesn't taper smoothly and the seller mentioned the back of the links look different to the 12 o'clock end. Will also need to get a replacement Sternkreuz crystal as it's got a little bit of scuffing. Great pictures, Achim. Sorry I cannot post pictures here, I had to learn it soon. I really love the simplicity of the dial on this watch, its not overdone like many of the 7A"s. This watch may be considerd the "ugly duckling" in the 7A world but i think its becoming more desirable. 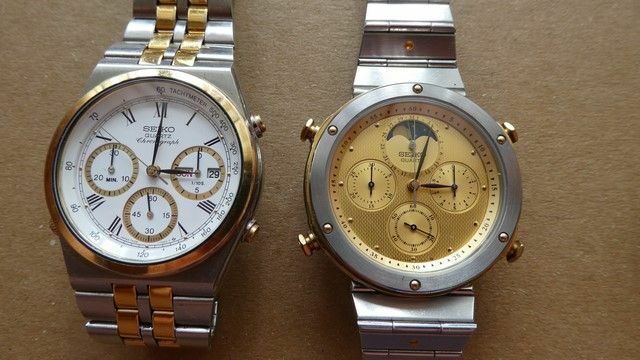 I have two in as new condition, a two tone and a all gold, I think they are just beautiful and under rated. No way would i part with them . Must get them out for a photo session soon. I added another 7A28 to the collection this week - a 7A28-7049. It needed a major case component overhaul. The pushers wouldn't push (at all) and the bezel was solid. Stripping it and cleaning it took a while but its come up very nicely. A new (correct) crystal finishes it off nicely and the bracelet fits with one hole to spare. I love these 7A28's. OK, I did get this one. On its way. Yema N80Q16 Flygraf. $350.50 US. It is NOS. 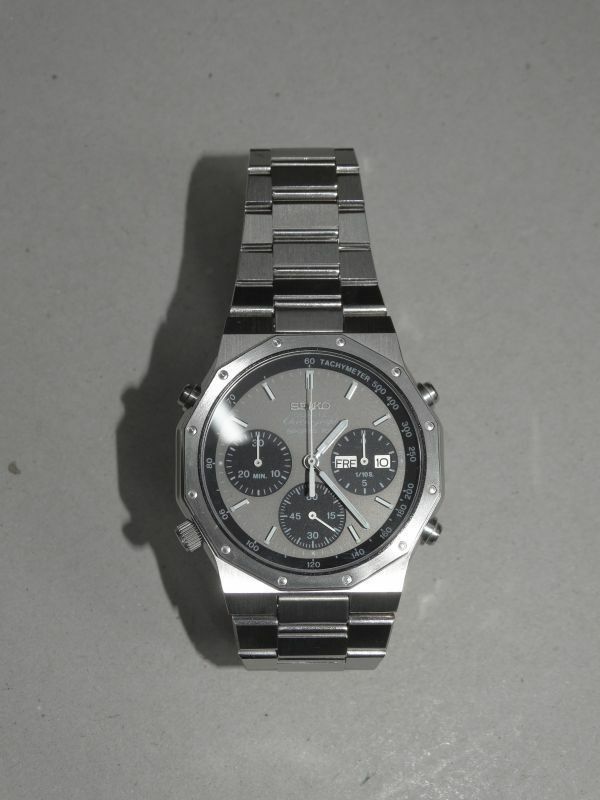 The watch arrived this lunchtime and is pretty much as I'd anticipated - a little grubby, but virtually unmarked. Indeed the SQ clasp is almost completely devoid of the usual 'Desk Diver' marks. There are one or two tiny scuffs on the bracelet, which is nice and tight with no link slop. Looks like the full complement of adjustment links are present too. The pushers have that nice 'as new' clicky feel to them - and despite the eBay seller's B/S message, the chronograph functions all work perfectly, with no hint of reset issues. 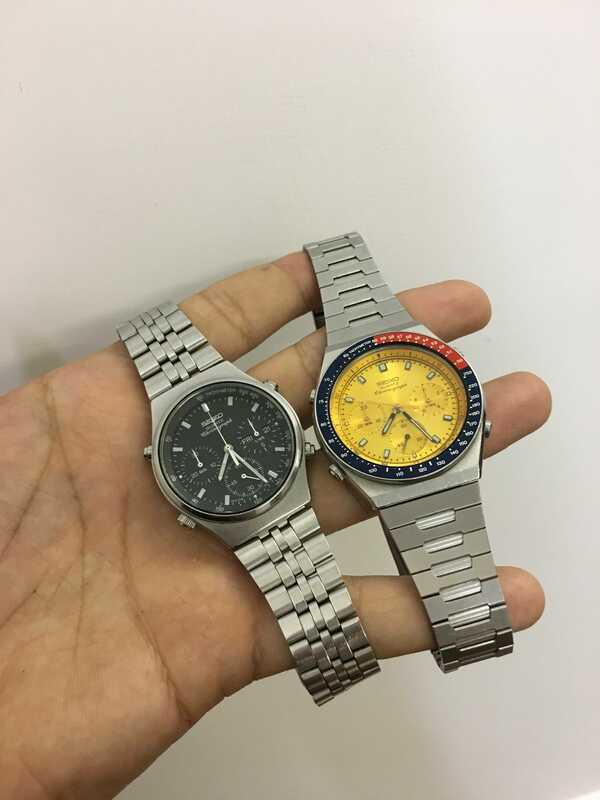 Funny coincidence that I should be making this post exactly one year after I bought my 'first' decent condition stainless 7A38-7020 SAA009J. I'd bought another good example in September last year - that one had cost me £160 and required a bit of fettling. It wasn't in quite such good condition, so ideal for use as a daily wearer - I refer to it as my 'beater', though in truth It's far from that. Since then I've watched the prices of these very popular models continue to climb skyward. It didn't worry me too much, particularly having bought the 'first' one (in quote) for £100 Quid. So I really didn't need another one, did I ? No. There were loads of them on eBay last month (mostly in the States and Germany) and I watched a couple of lesser examples sell for what I'd deem 'silly' prices. 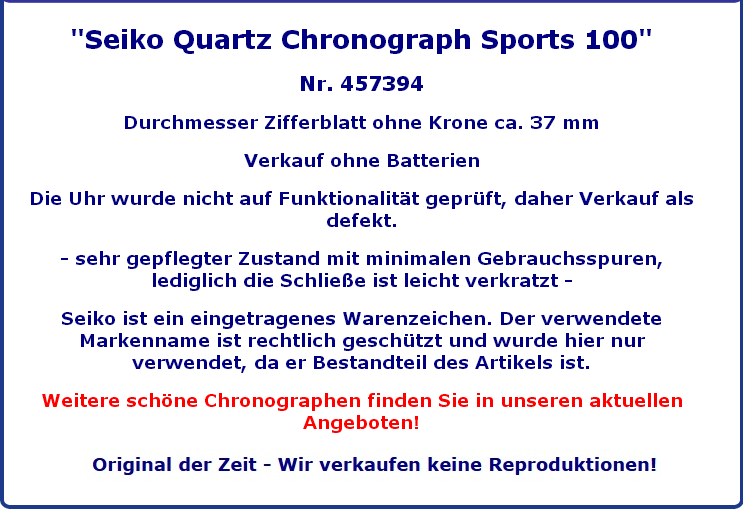 Then last weekend, I spotted another tidy looking looking example listed on eBay Germany, that had no mention of Seiko 7A38 in the title nor description. 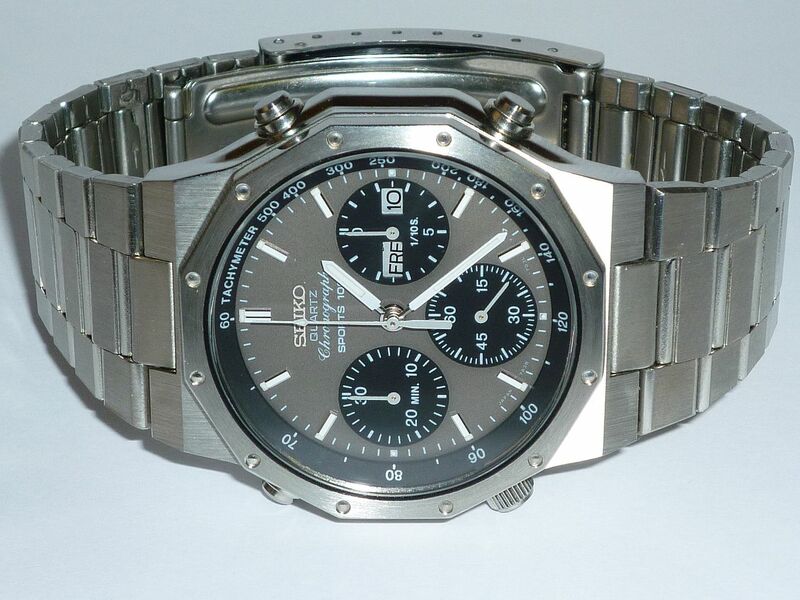 I'd bid it up to just short of 180 Euros, but there was another bidder who clearly wanted it more badly than I did. As I didn't really need another, I almost gave up and walked away, but at the last minute, caved in and chucked in a 'throwaway' snipe bid of 234.56 Euros (equivalent to approx. £200 Quid). Result ! It's in amazing well-cared for condition. Not a trace of a ding or scratch anywhere. There are the very lightest of swirlies on the clasp. You couldn't even call them 'Desk Diver' marks. 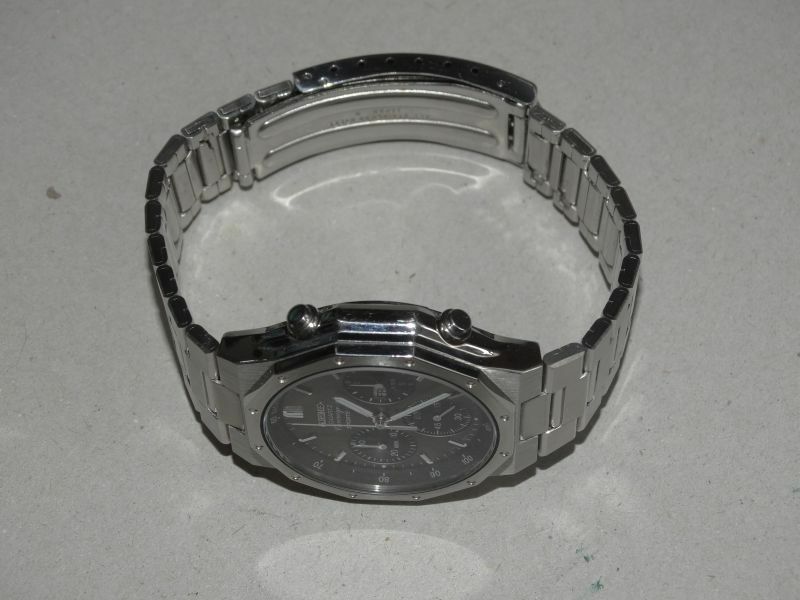 It needed a new battery and the addition of a couple bracelet adjustment links, to fit my wrist. 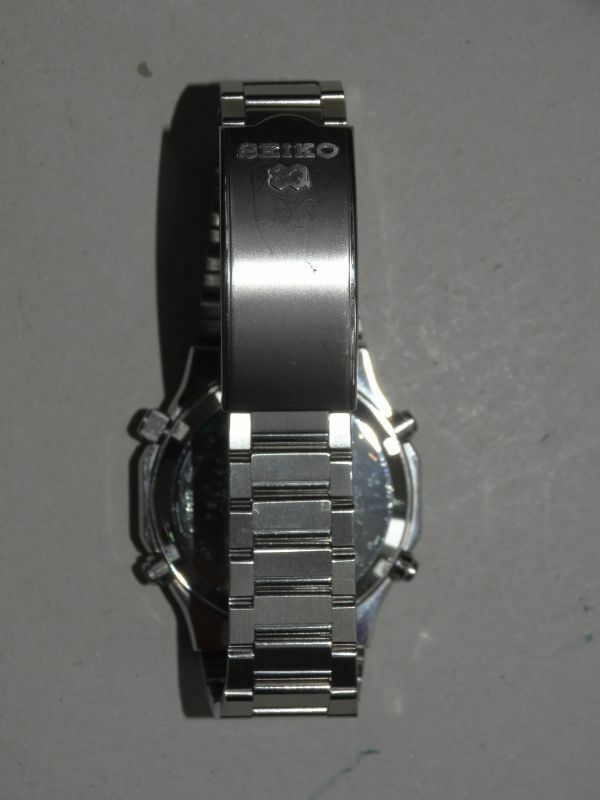 Only thing I can fault it on is the bezel is ever so slightly out of alignment with the case, by a degree or two. I'll tweak that later. 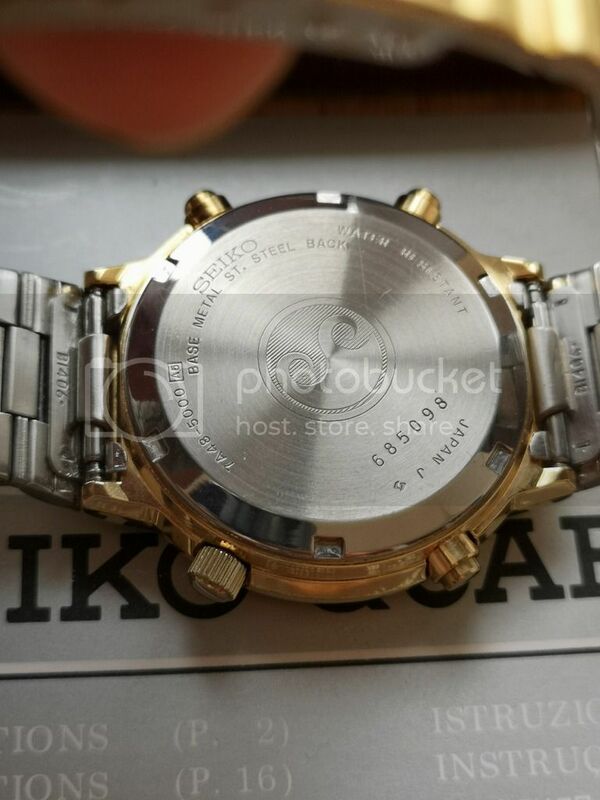 This one was sold on eBay by a seller in Bangkok. The title had a typo in "Seiko", spelling it "Seik o" with a space before the 'o' which I guess reduced the number of people who found it from a search. 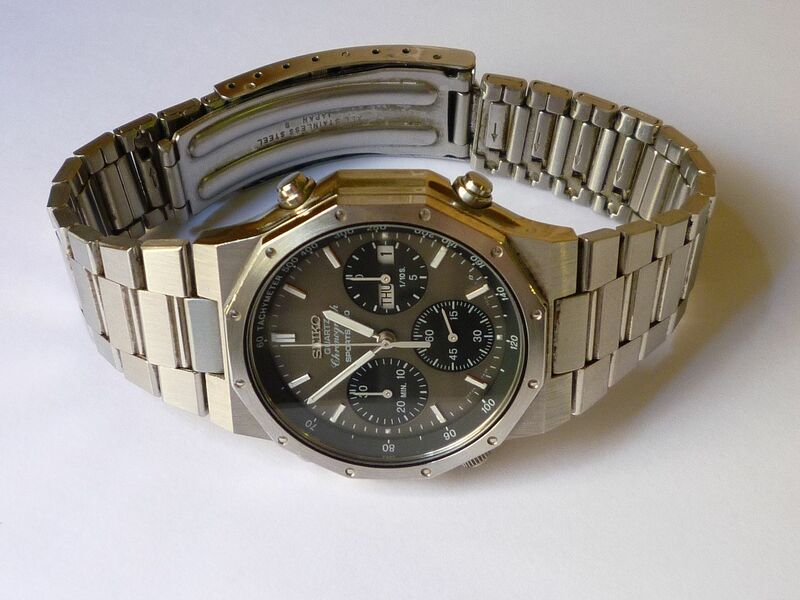 The description also described the chronograph as "not working" but it works fine. 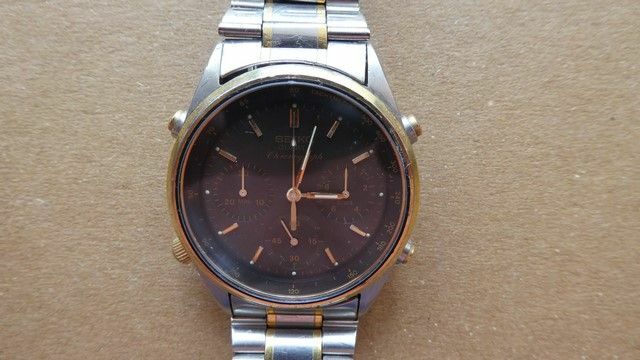 It's a very early 7A28, the serial number starts with 2O so dates it to October 1982. 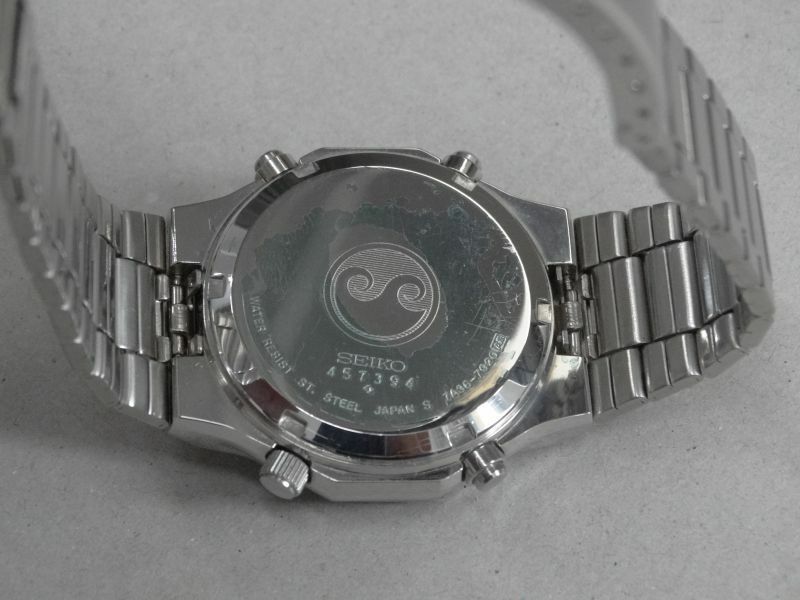 There are some very light scuff marks on the bracelet and face corners, a minor graze on the bezel by 1 o'clock and a small bump on the side by 3 o'clock. Other than that it's in great condition considering it's age. Worth the wait, I think. So this my first venture is the 7A world. OK , so its one of the least popular models , but its in outstanding condition (looks new) , everything works. I always try to buy the best example I can and the fact this came with box, manual and original sales receipt (£250 in 1987!) swung it for me. Now its here I actually quite like it. Hello guys, Ed here from Italy, this is my first post, showing my humble collection to you guys as encouraged by Paul. The 7A38 7270 has been my first watch of the series and now one of my daily watches as long with a classic SKX and my Explorer. Needless to say it made me fall in love with the whole 7A series. I know, the glass is a bit scratched but i already have the replacement glass, just need to be brave enough to do the swap myself as i can't trust any watchmaker near here. 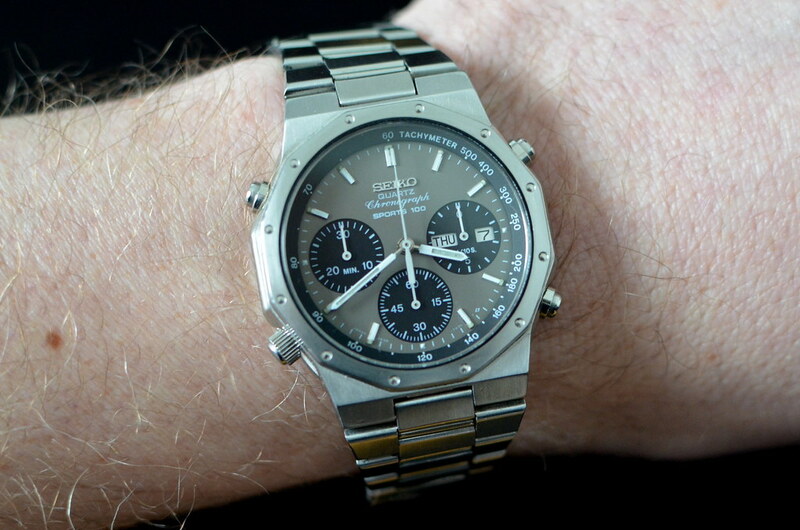 The 7A28 7030 is a gift a friend of mine gave to me a couple of weeks ago. 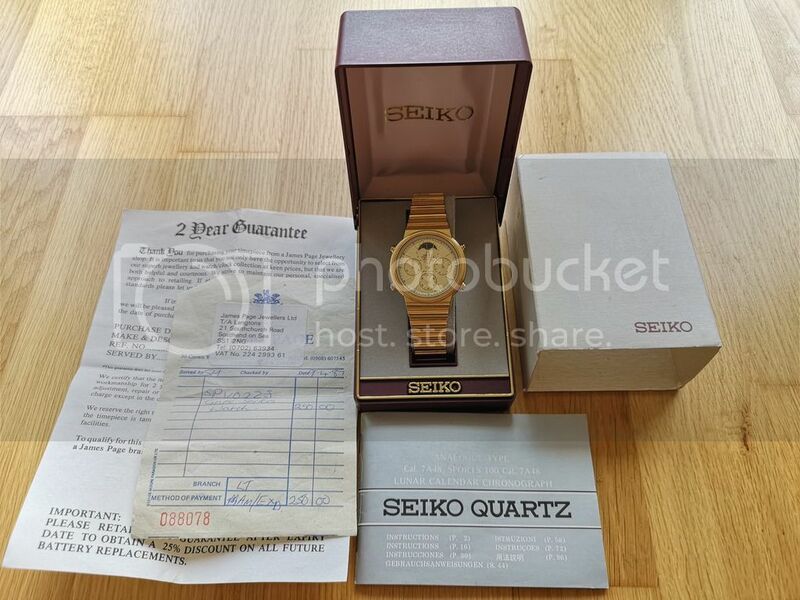 He called me saying he just found "an old Seiko quartz watch" and that i might have been interested in it. Of course i had an heart attack when i saw it for the first time cause i'd have never thought it was that particular model i dreamed about for so long. Now the problem is: it keeps good time but after the battery change the second hand won't just come back to twelve, it just keeps ticking while staying on that position when the chrono function is running. Strangest thing is it worked just fine right after the battery change, the problem occurred after 4 or 5 chrono tests. 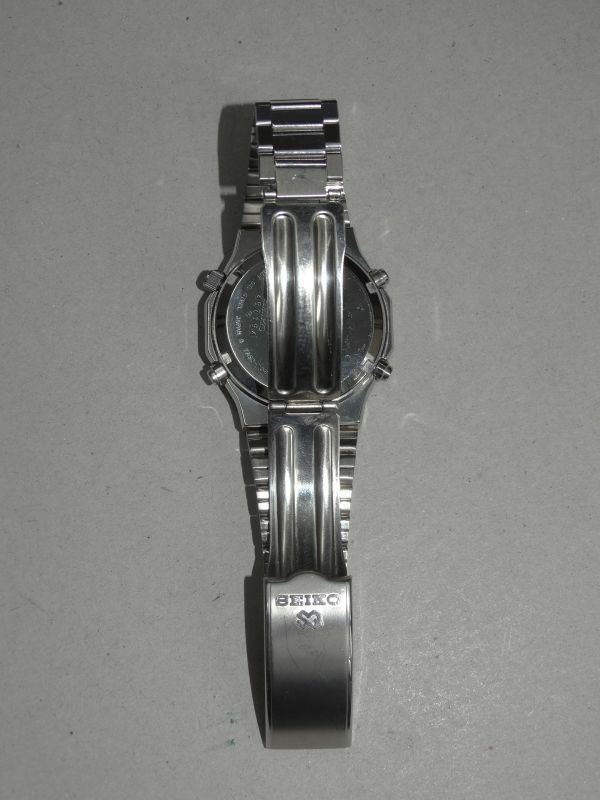 Also the finger tension spring is in its place and in perfect condition like the rest of the watch so that shouldn't be the problem. Any hint for repairing it would be really appreciated!